My Opinion On It Now: I own it but I do think it’s way over priced for what it is/does. If I had to do it all over again, I’d pass on this one. 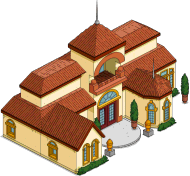 This entry was posted in Buildings, Decorations, Donuts, Should I Buy, Tips and Tricks, Updates and tagged Should I Buy Krusty's Mansion, Should I Buy Tuxedo Krusty, Tapped Out Tips and Tricks, The Simpsons Tapped Out, TSTO Addicts, TSTO Itchy and Scratchy Land Event, TSTO Itchy and Scratchy Land Update, TSTO Tips and Tricks. Bookmark the permalink. I picked this up when it was first offered and I still love the Krusty animations. The mansion looks cool on the beach with fancy fence, swimming pool, Canyonero parked in the driveway and now the I’m On A Rolla Gay! I was going to get the mansion but it’s way too small. Not something I thought I would be complaining about… But I have a space that could use a giant mansion. Don’t have anywhere to put this overpriced “mansion”. I have the skin but don’t think I bought it, especially for 60 donuts, was it free in another event? 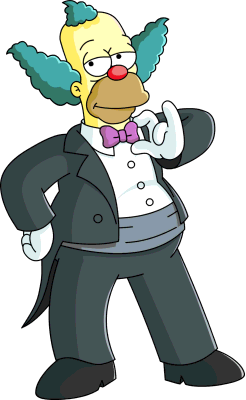 The Krusty tux skin isn’t worth it if you already have the Stonecutters outfit for him. That outfit already earns a premium amount.